Discussion in 'iPhone and iPad Games' started by touchy85, Apr 1, 2015. 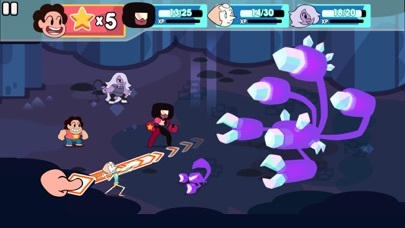 Fire off Garnets Rocket Gauntlets, summon Holo-Pearl, and put the hurt on your enemies with Purple Puma. 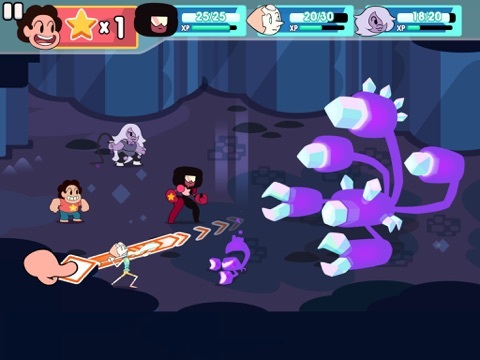 All four Gems have unique attacks and upgrades. Explore caves, fight bad guys, collect super secret treasure, and level up! 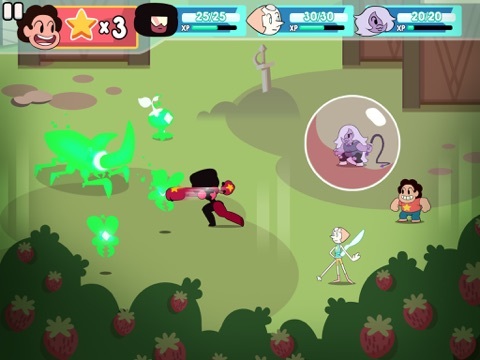 Load up Stevens backpack with all kinds of magical items to help you on your quest. Unleash the three-Gem fusion, Alexandrite! Shes a stone-cold Betty with mondo firepower. Dont just attack the Light, obliterate it with Fusion power! 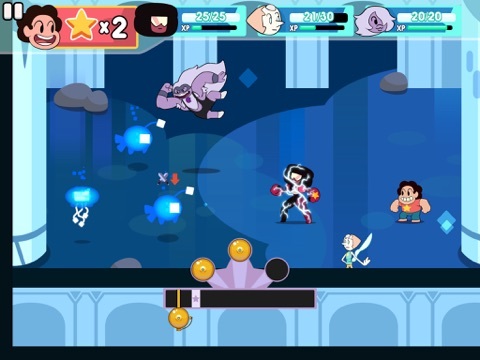 Attack the Light has an all-new storyline from Steven Universe creator Rebecca Sugar. 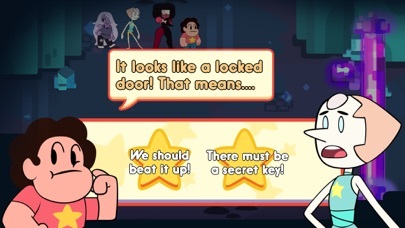 Plus, the game features original voiceover from Steven Universe cast members! I loved Battleloot Adventure's combat-centric turn-based gameplay, and same with Fearless Fantasy's similar gameplay, so this is definitely something i want to get my hands on. I feel like I need to watch these shows or else the game won't be as fun.. :\ I don't have Cartoon Network.. I've never seen this show, but I've been playing this nonstop since yesterday night. Absolutely loving it. Definitely buying this tonight! 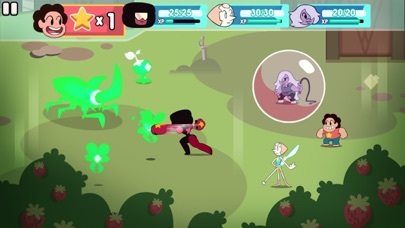 Love Steven Universe and how it turned from this quirky cartoon into a rather interesting, deep and emotional story it's evolved into with the whole gems revolting against their own and learning how they were originally meant to destroy earth, Steven mothers sacrifice and the whole thing. At first I was iffy but the show has really grown and has me wanting to watch it to see where it will go next. I watch these shows with my kids and look forward to them just as much as they do! 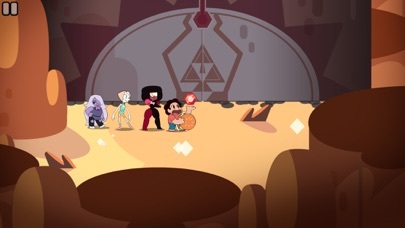 Steven Universe is definitely worth a watch especially now where the story has gotten! 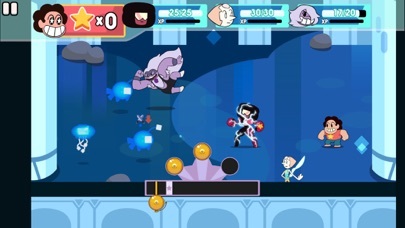 Really, you can't go wrong with any of the Cartoon Network shows or their games it seems! Really excited for TA to try this one out. The game is pretty big/long for mobile (in my humble opinion!) clocking in at around 8-10 hours for the main quest alone. After beating the main quest, there are extra optional bonus stages and 'gauntlet' stages to complete as well. We tried to strike a nice balance between the type of RPGs that we loved growing up, and something that still felt mobile/pick-up-and-play. The way the game is structured into various smallish stages allows for you to play in small chunks, or you can just as easily move through them fluidly to enjoy for extended play sessions too! OH also: there are no IAP and no ads in this game! I do believe I have every iOS game you guys have released. You never disappoint, and I love buying the things you guys make. I'll get it as soon as it hits U.S. Thanks so much Xatu Hope you dig this one too! Looks cool and I'll be grabbing but why not stick adventure time or regular show characters / skins on this get 10x the sales and a guaranteed feature from apple. Maybe this is an up and coming popular show idk. Better yet when is a legit rick and morty game coming out? balloon pop is ok but just really voiceover. Ahhhh!!! Just a couple more hours!!!! I'm SO friggin psyched! Can't wait! I missed out on GFS last title since it was iOS 8 only... So I'm especially excited to get into this one (being a HUGE Grumpyface fan...). Ya, this is as fun and cool as I figured it wld be. Played about ten minutes and I'm hooked in. Good stuff indeed. Yep, just like very game you guys have ever released this is wonderful. 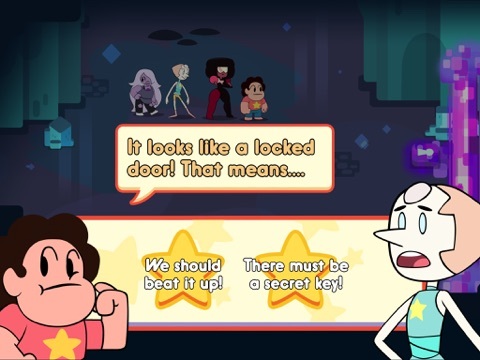 I'm glad CN hires you guys to do games, because you do an amazing job. The moving system lets you replay levels quickly and the combat isn't dull like a typical rpg. Not to mention using stars makes you consider your moves before you use them. Wow, loving this game. But I must have terrible reflexes because I miss every chance to defend! Alrighty... So far, I'm definitely diggin it. I was a little worried when I saw that it was level based, but the stages get fairly large and wind up having secret areas you need to come back to after grabbing items and the Gaultlet stages are great... I dunno if they're endless, I haven't gotten very far into them yet, but the difficulty jumps quite a bit there which is great. I also love that you leave all your items at the door and have to collect items within the Gaultlet stages. Nice little touch there. The voice clips and animated scenes are great... Gameplay is great, I love how you handle the AP! I will pick this up for sure, the cartoon is great. 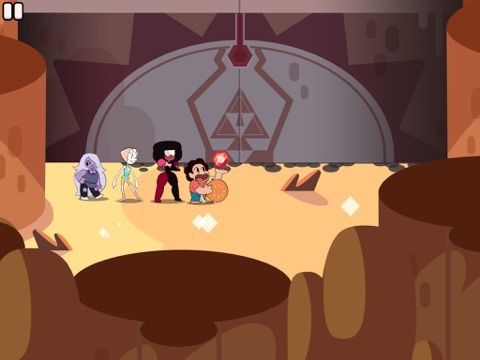 From what I remember a girl that was part of a he Adventure Time team left that show to create Steven Universe. Looks like the same RPG battle scheme as Valkyrie Profie for PSP.